Welcome to my Factory design pattern tutorial. This is a continuation of my design patterns video tutorial. You use the Factory design pattern when you want to define the class of an object at runtime. It also allows you to encapsulate object creation so that you can keep all object creation code in one place. 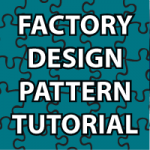 The Factory pattern is presented in many ways to help you learn. Refer to the code that follows the video to completely understand it. // and that is bad! Hi Derek, many many thanks for all these awesome video tutorials on Design Patterns. Just wondering why not also you provide the Alien Spaceship diagrams related to individual Tutorial? Those will be really helpful. Thanks once again. hi this is really great and helpful. Thx for the dedication. i don’t see you use this local variable? Hi Derek. Thank you so much for the tutorial. I have started to learn your tutorials on Design Patterns. Though I have not learned Java, I am able to follow your code. I know C++. So what I do is after going through your tutorial, I implement the code example for the design pattern in C++. Oh My! I am learning a lot. Now coming to your tutorial on Factory Design Pattern. I have tried very hard to get a solid understanding on this design pattern for quite some time now. But I never succeeded. At last your tutorial provided me much needed succor and it took just 11 minutes to understand the entire thing. Thank you so much for this, Derek. I am a big fan of yours. As always you are always succinct with your tutorials. Since EnemyShip class is abstract, How can we create objects of the same? We are actually calling the constructor for either UFOEnemyShip or RocketEnemyShip. In the above I’m declaring that I will use EnemyShip to refer to data and nothing else since it isn’t a primitive. Later when I call the constructors mentioned actually creates an object. Does that make sense? Thank you so much for all the work you put into your tutorials, having been a software developer in Java for 12 years I can honestly say I’ve learnt more from your site than at work! Believe me it’s frustrating beyond belief trying to code blind not knowing how things fit together and not knowing where to go! My question is related to why the EnemyShip class is abstract, is the idea of the pattern to have it abstract? The reason I ask is that the class has concrete implementations so it could be just as well a concrete class? I’m very happy to have been able to help. I basically made it abstract because there is no reason to instantiate EnemyShip. That is basically the only reason. Derek your videos are extremely helpful, just a small suggestion, while organizing the classes, please group them together in a way that makes the code more readable. For example while reading from top down I would like to read UFOEnemyShip, rocketShip and BigUFOEnemyShip together, then the EnemyShipFactory and finally the class containing the main method. Your videos are clear, precise, straight and has lot of information. Thank you. I have a question: what is the purpose of making the EnemyShip class abstract? since there are no abstract methods, or final or static fields inside the EnemyShip, I guess it is to make this class not to be instantiated, but if so, why do it that way? First of all, thank you very much for another excellent tutorial. My question is, in EnemyShipFactory.java. You are using if statements here. I remember you have a refactor tutorial about this. In there, you used switch (same as if) first and then used reflection. I think that you were required not to use any if or switch statements in a coding challenge. What is the best practice to create ships when applying Factory Method design pattern? It changes depending on the situation. I know as programmers we start off learning a ton of rules. In the beginning there is always a right and wrong way of doing things. That pretty much ends once you get advanced and start using things like design patterns and when you refactor. You learn when to use these things through a ton of experimenting. It is more art then science at this point. Even the GOF design pattern book says as much. Now is when you truly become an advanced programmer. Enjoy the journey. Thank you very much for video. All design pattern concepts are very nicely presented with exeample . Do you have videos of webservices (CXF) ? You’re very welcome 🙂 Sorry, but I don’t have them all in one zipped file because that would be quite confusing because there are so many files. I do however have everything on one page here Design Pattern Video Tutorial. One question, in a scenario where one factory to produce multiple products. In this case, Factory class job to produce EnemyShip as well as HeroShip (multiple products). Then to accommodate this requirement I guess we need to have another method makeHeroShip() with return type HeroShip in the same Factory class (suppose ShipFactory). am I right? Or there is more better way to achieve this. Please share your views. I don’t need a college degree. I just need DEREK BANAS! Awesome tutorials dude. I am going to Donate five bucks. I will donate more when I can. I have been watching your tutorials everynight and I’m enjoying them very much. Thanks! Eric. Thank you 🙂 The compliment is all I ask for. There is no reason to donate. That is there only because my wife forced me to use it. I have exams next week and your videos really helped me. Thank you 🙂 I’m glad I could help. Best of luck on your exams. Hey Derek, a big thank you all the way from Scotland, your video’s have been a great help. Thank you very much, these videos are really helpful for me. You’re very welcome 🙂 I’m glad they are helping so many people. Thanks for this video. It helps in understanding factory pattern with ease in short time. Can you also list down cons of factory pattern, complexity introduced by factory pattern, and other pattern that can be used as alternative. Hi, You may find that dependency injection is often a better option over the factory pattern. We use factory to separate the use of a component from the implementation and instance management of that component. The major drawback of the factory versus dependency injection is that it can be complex and hard to test. I was curious what you used to create the UML diagrams in your videos? Normally just paper and pencil. UMLet is nice though if I need it. Visual Paradigm is the best program, but expensive.